Very strong 7-2 earthquake struck 16 km (9 miles) NNE of Van, 118 km (73 miles) N of Hakkari, 127 km (78 miles) SSE of Agri (Karakose), Turkey (38.628°N, 43.486°E) at depth of 20 km (12.4 miles) set by location program. The earthquake was felt in Syria, Iran, Lebanon, Armenia, Azerbaijan and Israel. USGS has changed its numbers to the positive side : 7.3 gets 7.2 and the depth of 7 km is updated to 20 km. This is at least a weakening message. Still very dangerous and violent though. 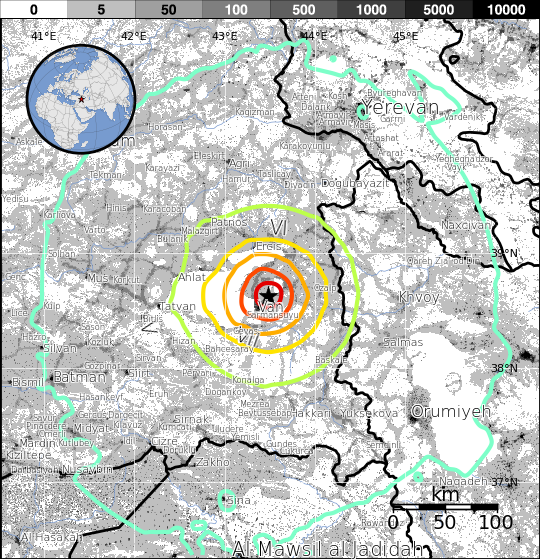 The epicenters of the Van quake are quite different between USGS and KOERI (Turkish). USGS shows that Van is more at risk than Ercis – with 3 felt reports giving an intensity of 9. KOERI shows it closer to Ercis. 33 aftershocks between 2.9 and 5.6 followed. Estimates of loss of life are 700-1000 according to Prof. Erdik, who is in charge of the ELER program. Town of Bitlis has also reported some destroyed buildings (Bitlis is approx. 100 km from the epicenter). Death toll in the many villages in between could become very high too. Other earthquake loss estimation procedures are reporting much heavier losses. PAGER (USGS) is estimating around 12,000 median deaths, with around $15 billion damage. Please refer to their whole range of estimates, as there is a large uncertainty at this point. We want to emphasize that these numbers are PRELIMINARY THEORETICAL numbers, based on the measured data and the historic earthquakes in the area. 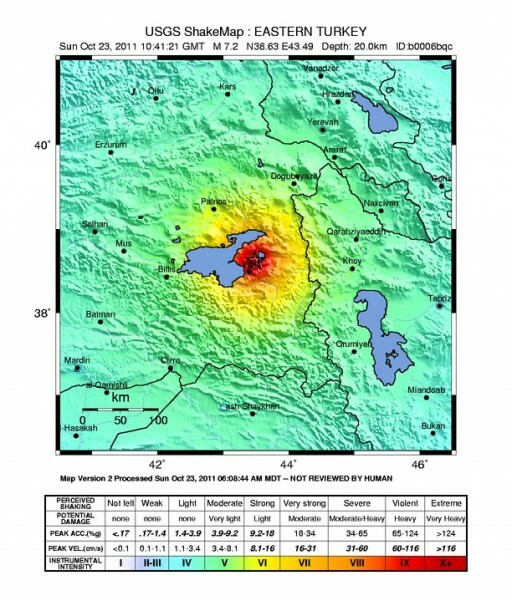 The 1976 earthquake on the Iranian-Turkish border was a M7 and killed around 5000 people. If we are looking at a direct hit on Van, the highest death percentage likely is around 6-10%, which could mean values of dead around the Izmit earthquake – between 19000-38000 dead. The cold weather is also affecting people and the need for shelter as night falls becomes a major concern for residents. Many people will sleep in the streets scared to return to their homes. This video shows that the shaking was very violent. Deputy Prime Minister Bashir Atalay: “According to information received from Area around 10 buildings were destroyed in the center of Van. Another 25-30 buildings and a dormitory building was destroyed in Ercis. Additional damage may be found in the villages. especially some of the villages attached to the hub there may be more damage. The Prime Minister and Emergency Management and Red Crescent in the region noted Atalay Airlines plane with 160 people and a military aircraft to bring relief supplies to the region has been sent"
There have been over 100 damaging earthquakes through history in CATDAT with 100km of this epicenter. Here are some of the most damaging ones that have affected Van. 1111- Van earthquake caused major damage, with a magnitude of around 6.5-7. 1646-1648 – Van was again struck by a M6.7 quake, killing around 2000 people. 30th May 1881 – M6.3 – near Van – killed 95 people. In 1941, a M5.9 earthquake affected Ericis and Van, killing between 190 and 430 people. A swarm of smaller earthquakes from 1945-1946 killed many people in Van. The North Anatolian Fault caused additional damage in Van from a 4.9 quake in 1972 with 10 injured. In 1976, 66km away from this one, a M7 quake on the border killed 3840. 51000 homeless.